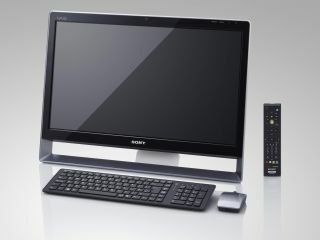 Sony has announced the Vaio L series all-in-one PC, bringing Blu-ray and a 24-inch touchscreen to take advantage of Windows 7. The Vaio L Series – which has a UK release date of 22 October, the same day as Microsoft's Windows 7 – is the first touchscreen Vaio all-in-one. "The highlight of the Vaio L Series is the big, beautiful 24-inch widescreen X-black LCD with Multiple Lamp Technology for a crystal-clear view of your photos, camcorder clips, movies on Blu-ray Disc and more, all in full HD," says Sony's release. "In a first for Vaio, the stunning display is also an ultra-high resolution touchscreen that takes full advantage of the new features in Windows 7. "It's never been more easy – or more fun – to explore and navigate through documents and applications with simple gestures… and no mouse or keyboard needed." Drilling down into the actual specs, there are two flavours of the L-series: the Sony Vaio VPC-L11M1E/S and the more powerful Vaio VPC-L11S1E/S. The headlining Sony Vaio VPC-L11S1E/S brings a 3Ghz Intel Core 2 Duo E8400 processor, 4GB of DDR2 RAM, 500GB HDD, Blu-ray and a DVB-T television tuner. The lower specc'ed VPC-L11M1E/S has no Blu-ray or DVB-T and a less powerful E7500 2.93 GHz processor. We're still waiting for confirmation of UK price for both of the Sony Vaio L-series PCs, but expect it to make a sizeable dent in your wallet.